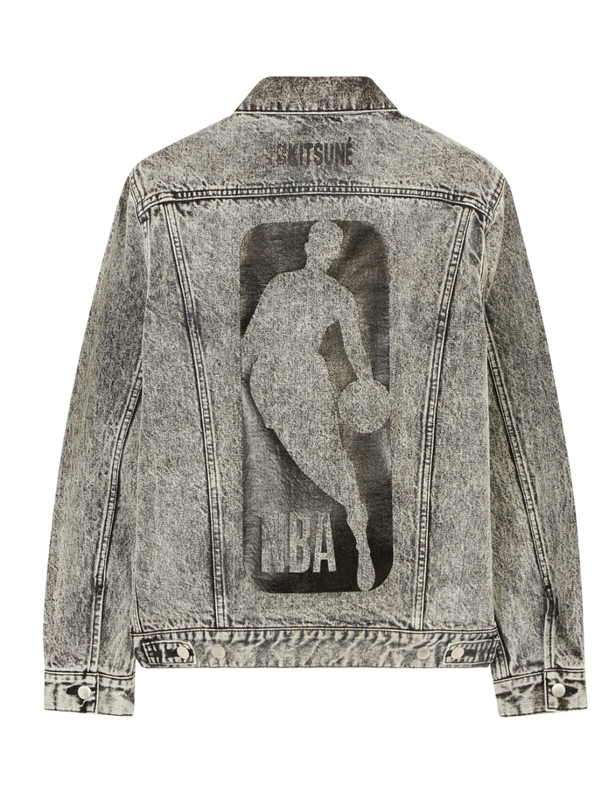 The Crossover recently caught up with fashion designer Masaya Kuroki on Maison Kitsuné's 15-piece collection with the NBA. That’s how Maison Kitsuné co-founder Masaya Kuroki describes his latest collaboration, a 15-piece collection Kuroki worked on in tandem with the NBA. The Parisian brand was not an obvious choice for a collab with the hoops league, but Kuroki and his partner Gildas Loaec have frequently taken risks since the brand’s inception in 2002, blending their lifestyle interests of music, entertainment and sports with their fashion house. Earlier this month, The Crossover caught up Kuroki to discuss the inception of the collaboration, the inspiration for its design, and Kuroki’s all-time favorite shoe. Rohan Nadkarni: How did this collaboration come about? Did the NBA reach out to you? Masaya Kuroki: So, it’s so rare, this case. It’s hard to explain. Usually you see a lot of collaboration, it’s just licensing. They pay for the logo and put it on a t-shirt. We wanted to do something different. I’ve played basketball since I was a kid, I grew up in Europe and I lived in New York in the '90s. It was a culture shock for me to see how fashion, music and sports could be combined altogether. Maison Kitsune, it’s a music label and a fashion brand. Me and my partner Gildas have always been inspired by our lifestyle for this brand. A lot of collaboration is happening around the world. We wanted to do something that would be a little bit of a surprise. We’re such a small brand compared to the NBA. Obviously nothing can compare, it’s two different worlds totally. But when you don’t try to do something—when there’s no action, there’s no reaction. And we’re always looking for some reactions. We contacted the NBA first, and they were like, “Of course, a lot of players are wearing your brand already.” I was very happy to hear that. So we made a small collection and showed them the design, and they were into it. RN: What’s your relationship like with basketball? MK: Four years ago, I moved to Japan. I live in Tokyo, and my partner lives in Paris. I grew up in Europe, where basketball is a little bit in the shadow of soccer. I never played in any club or league, but I always played basketball on the street or in the playground. So that’s why the collection is all gray, sort of black. Because on the playground, there aren’t really any colors. There’s cement, concrete, steel. All gray. RN: What was your inspiration for the design? MK: The NBA is famous for being rich in colors. Our thinking was, when they sent us all the files, the fonts and the logos, we wanted to be like 2018, where everything is influenced by sports or art or entertainment. A lot of hip-hop, soul, R&B and rock, a lot of entertainers are wearing colorful NBA jerseys or stuff like that to represent their city. Well, I don’t have that team or that city to represent. So I came up with this idea of the street, or the playground. That’s why when you see the whole collection, it’s all about different shades of gray. RN: What are the challenges in a collaboration like this? MK: The challenge is the NBA is a huge, huge brand and network. And then we jump in from nowhere. We have a little bit of retail in New York and Paris, and then Tokyo, but we are an independent company. We’re not a big group. We’re not like Louis Vuitton or Hermes, all these world famous fashion houses. It’s like the underground vs. the overground. RN: Do you have a favorite basketball shoe? MK: Yeah, Air Force Ones. I’ve always been wearing them. They were the first sneaker I had when I was 18. When I first went to New York in 1994 or 1995, there was a big culture around the Air Force One. You’d see all the cool rappers or anyone who was cool wearing them on the street. It’s always been Air Force Ones. The name is already crazy. Air Force. One. It has the name of like NASA, or something. It sounds like you’re going into space. It’s a dream name when you think about it, if you’re a kid. “What are your shoes called?” “Oh, they’re Air Force One.” It’s almost like Star Wars. The design is—there is a lot of temptation of changing this shape, still for me, it’s the best. They’re so comfortable. I play ball in Air Force One high-tops. And then, low Ones every day for work. My wife is tired of it. “How many bleachy white Air Forces can you have?” Well, when one gets dirty I clean them up straight away. It has to be white for me. And it’s timeless. I love everything that has a timeless design. RN: Do you have a dream collaboration you’d want to work on? MK: That’s what the NBA was! Once it’s done that will be the dream come true. Hopefully people watching basketball or people seeing the collection are like, “I’ve never seen that logo before.” I love to create a curiosity, because without curiosity, you’re done. It’s boring.